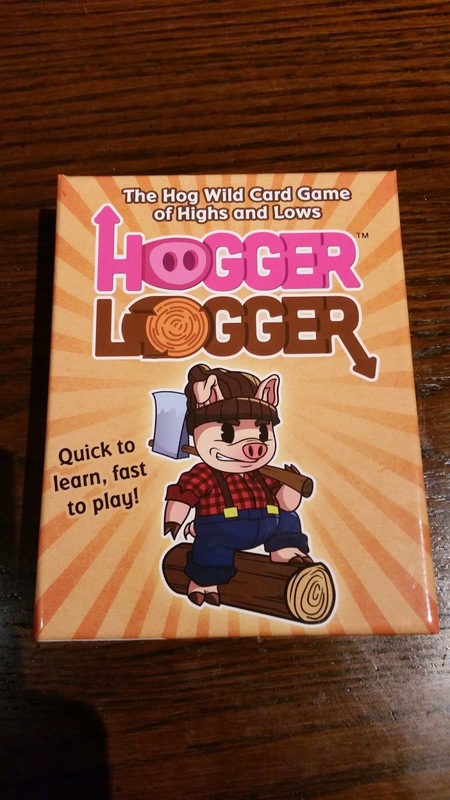 Hogger Logger, which was successfully funded on Kickstarter last summer, will be released shortly, and, if you like party games at all, you should get a copy immediately. It's one of my four favorite party games - and only one of two that's published. Really, the review is as simple as that. What? I need to write more of a review than that? Fiiiiiiiiine... Keep reading. 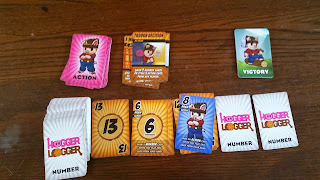 As a party game, Hogger Logger is not complex. Its core mechanic is guessing whether the next card played will be higher or lower than the previous card drawn. If the player guesses correctly, they get to guess again - unless that was the last card to draw of the round, in which case they win the round. To complicate things, though, other players can play number cards from their hands to make the guessing more difficult or action cards to affect play in various ways, from swapping hands to forcing the player to guess "hogger" (higher) or "logger" (Iower). If you play doubles (e.g., if you play a 6 on a 6) or an 8, you draw an Action card. Some of the number cards allow you to draw new number cards. (There are a few other rules - so if you want to see an instructional video, click here.) If this doesn't sound like much of a game, it didn't sound like much of one to me before I played the first time. Keep reading. 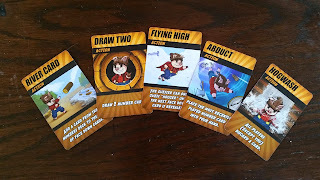 I've alluded to the story of the first time I played Hogger Logger in an article for League of Gamemakers, but now that I'm reviewing the game, I can tell the whole story. It was at DexCon last summer, and Ryan and Charlie had played a game I was running and then asked if I wanted to play theirs, which they pitched as "a game where you try to guess whether the next number drawn will be higher or lower than the one before". I came up with an excuse for why I couldn't play but promised to check it out later. How could that game be any fun, right? The next day, they stopped by my booth and Ryan asked if I wanted to see a magic trick. Of course I did. Being both cynical and clever, I can usually figure tricks out - but not this one. It was a full blown, slackjaw response. And he told me if I checked out their game, which he said takes about half an hour, he'd show me another one. Fine. Good sales pitch. I'm sold. Within three minutes of playing the game, I was sold on the game, too. Yes, the core mechanic in the game is guessing whether the next number will be higher or lower, so there's always a correct guess. In that sense, the game plays you. 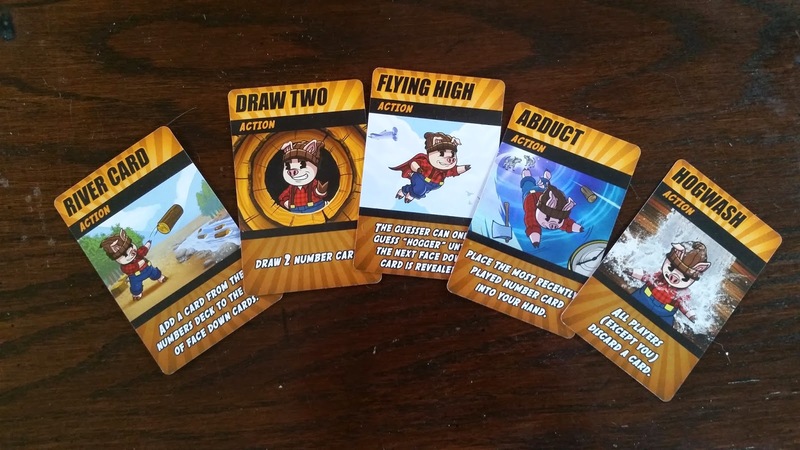 And when they first described the action cards, it seemed like I'd be playing an updated version of Munchkin, where players scramble to stop a player from winning until everyone runs out of cards and someone wins more or less by default. Somehow, though, that doesn't quite seem like I've got all of what makes it a great game - but that's what makes it such an impressive magic trick. Maybe it's that the graphic design is fun, bright, and charming. Maybe it's that the game's mascot is a pig who's also a lumberjack named Pork Chopper. Maybe it's that the synthesis of all of these elements just makes the game so, so much more than the sum of its parts. Maybe it's the Apple product of boardgames - but fairly priced. I don't know for sure. Maybe it's the awesome, fun art on the cards. I do know, though, that the game doesn't just work - it's phenomenal. It's a fun, funny, fast, light game that's worth every penny I spent on it. I even backed their Kickstarter for two copies because I'm sure I'll wear through my first copy in no time. This is going to be a game that gets broken out at every party I have for the foreseeable future. Hogger Logger is perfect. It's a party game that can be taught in under a minute, and it can be played with anyone who has a basic understanding of how numbers work. And for $15, that's pretty darn magical.